I am Diane, wife to John, and mom to 5 beautiful children. 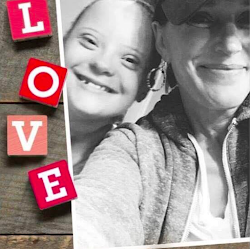 My youngest, MaryEllen, affectionately called ME by many, has Down syndrome. Her birth brought me into the most amazing company of strangers who are now many of my very best friends. I began blogging after her birth as a way to help my family keep up with us. When ME had open heart it was a wonderful way for them to stay up to date. I continued as a way to share my journey with others. This blog led to many people contacting me and in 2008, I founded the International Down Syndrome Coalition, to offer support to families who were new to the Down syndrome diagnosis, and connect them to local support. In 2014, I stepped away from advocacy, and the IDSC, to take a deep breath, and get back to some of the things I used to love doing. I am also an individual who is severely deaf, which has had its own set of challenges through the years. However, that does not stop me from living out my dreams! In 2015, I opened Dreamers Coffee which very quickly became Dreamers Merchants! Our plan was to open a coffee house so that we could employ individuals of all abilities to show the world that every person deserves the dignity that jobs innately bring each and every single one of us, including individuals with a disablity! It is said that only 20% of individuals with an intellectual disablity are employed. We wanted to bring attention to that abysmal rate and see if we could help it along. Along the way, so many people wanted to sell Dreamers Coffee that we opened a coffee company instead! We now have a small Dreamers Coffee kiosk that sells Dreamers products, and hosts events and training at the clubhouse at Vantage Point Golf Center in Cordova, TN. Along with this we have 27 online stores with store owners in 13 states nationally and growing. We offer support and training on how to become and entrepreneur so families can grow their own businesses, and along with us, hire individuals of all abilities. For more information on how you can be a Dreamer check out our FAQ page on our store site!